Far too many traders still think that the key to long-term success is hitting lots of winners. We all need winners, of course, but the focus for smart traders is always on value. After all, find value consistently and profits will follow. Tonight, many gamblers were 'lumping on' the likes of Manchester United to beat Hull and Newcastle to beat QPR at silly odds and neither of them won! I wasn't planning to trade this evening, but I was chatting to Kevin on the phone and decided to write another case study, similar to the others I've done recently. If you missed them, click here to read how I made 4.67pts profit in 2 hours (or keep reading this one - I made a bigger profit this time!). Before the fixtures kicked off I spent 15 minutes scanning Team Stats for strong trading opportunities. I picked out 5 trades and they all went on to win. It simply doesn't get any quicker or easier to make a good profit from football trading on Betfair. I didn't even use large stakes, just small affordable amounts. This was dead simple. Stoke had been leading at half-time in 4 of their last 5 home games, while Everton had not been leading in any away game this season. I considered backing Stoke to win the first half, but Everton had been level at half-time in their last 4 away games. I decided to back the half-time draw at 2.32 (£10) and lay Everton (first half) at 3.30 (£10). 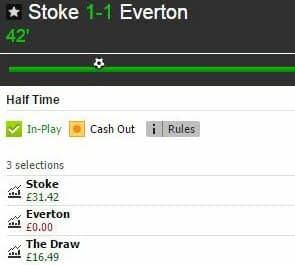 I was planning to lay some of the profit from the draw after 20 minutes or so in order to reduce the red on Everton, but Stoke took an early lead. This left me with scratch on the home win and a nice profit on the draw; a very safe position. Everton equalised on 39' and I was able to lay the draw to secure £16.49 profit. Backing Stoke to win the first half would have been a profit too as I'd have traded at 1-0. I don't know if it would have been more or less as I didn't track price movements, but either way was good. The key was matching up Stoke's strong first half performance at home and Everton's poor first half record away. A gold star to Team Stats for providing that information. Blackburn are struggling this season, but Team Stats showed me that they play much better at home than away. They had only been behind at half-time once in their last 9 home games and that was to league leaders Brighton. Leeds had only been ahead twice at half-time away all season and their away stats were all well below their home performance. I did exactly the same here as at Stoke; backed the half-time draw at 2.10 (£10) and layed Leeds to be leading at half-time at 3.30 (£10). 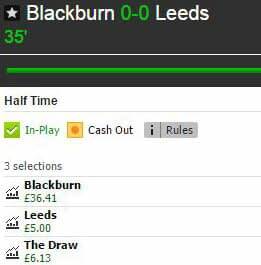 I started to lay profit from the draw around the 25' mark and by the time 35 minutes had been played, I was left with £6.13 profit if it stayed 0-0, £5.00 profit if Leeds were to score or £36.41 if Blackburn were able to sneak a goal. The score at half-time was 0-0 and that was another profit in the bank. 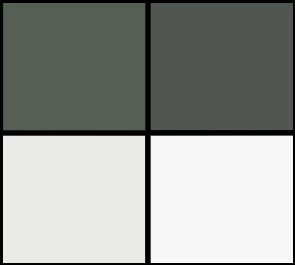 These two first half trades were fairly aggressive as a goal the wrong way would have left me with work to do. However, I had the two most likely outcomes covered in each and I was comfortable with the risk/reward. That was enough trading for the first half and I moved on to a couple of full match opportunities. This was not the strongest, but Team Stats showed me that Hearts were slightly better at home while Rangers were a little below their average performance away. For example, Hearts were 4th in the overall league table but 3rd in the home table and 3rd in the first half table, while Rangers were 2nd in the league overall but 3rd in the away table (6th in the first half table). Remember I talked about value? What really sealed this trade was that I could back Hearts at 3.25 (£10). A strong home team at home to a slightly weaker away team at that price was too good to refuse, especially as Hearts had already beaten Rangers 2-0 at home this season. What value! 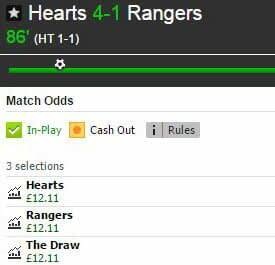 It was 1-0 after 4' and I immediately layed Hearts at 1.80 (£10) so that if they didn't win, I wouldn't lose a penny. Now I had a free bet. Early in the second half the score was 3-1 and I locked in £12.11 profit no matter what else happened. Great risk/reward here; £10 to win £12.11 at 121% ROI (return on investment). Remember too that after only 4 minutes had been played, it was zero risk as I had traded! A similar story with this one. According to Team Stats, St Johnstone generally play above their position in away games, while Partick struggle at home. Add the fact that earlier in the season this very same fixture had ended 0-2 and I was happy to back St Johnstone at 2.96 (£10). It just seemed as though the market was completely wrong. I was a little worried in-play with Partick dominating the shot and corner counts, so when it went 0-1 I locked in a profit of £7.82. The final result was 0-1, but I was out with my profit long before then. Burton were largely performing at the level of their overall league position, but bottom of the home form table. Their first half performance at home was better and Fulham were only 1.93 to back, so I let the game go in-play. I don't like backing under 2.00 - especially away teams. Around the 40' mark, Fulham were well on top going by the shot and corner counts, so I backed the away win at 2.24 (£10). It was 0-1 on 48' and I greened up for £7.23 profit. With the favourites ahead, playing well and profits locked in elsewhere I could have let it run - the game ended 0-2 - but by that point I was happy to bank the extra profit and seal a good evening. A couple of first half trades, two full match trades and one in-play for a nice balance to the evening. As I said right at the top, my research took ​around 15 minutes and then the trades themselves needed very little time. I reacted to goals here and there, but during the two hours that the games were in-play I watched a movie. It's not bad being paid to do that! I banked almost £50 profit from no more than 30 minutes of my time yet there will still be some who try to tell me that football trading takes too long. Can you believe that?! So... was tonight some sort of fluke? Well, these are in-play trades I have posted in the Goal Profits trading chat room recently. I told members exactly what I was backing/laying so that they could follow if they wished. Of course, all members can achieve these sorts of results on their own with a bit of practice as they have access to exactly the same information as me. The key is being determined to succeed, rather than quitting at the first sign that Betfair isn't some sort of magic ATM which spits out money. If you're keen to start trading football on Betfair with us, click here for all the details.